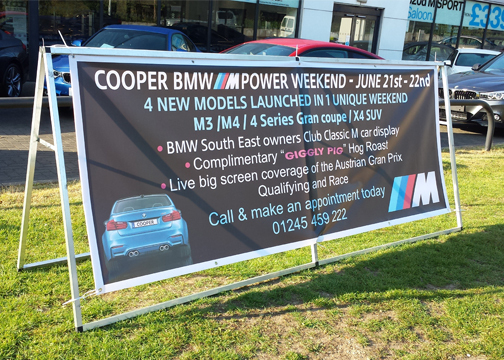 Banners are the quickest way to get your business or event publicised. With startling full colour and images, banners can be produced up to 10m x 2.5m. Our design service will take you from concept to production with the minimum of effort. There are significant discounts available for larger orders or long, multi-product campaigns. Talk to us if you are a charity or involved in fundraising for a project. We can offer significant discounts to help you with your project. Walk down any High Street and you will see a variety of styles and formats for shop branding. Large corporates such as Boots, have a house style that requires each store to be branded in an identical way, irrespective of the building type or construction. Older properties may have a restriction to only use wood rather than aluminium or plastic. In most circumstances, the design consists of a fascia made from either plasic or aluminium. On this is mounted your name, some other text and possibly a logo. There is a multitude of ways this can be designed and mounted, either cut vinyl, acrylics directly glued to the panel, or mounted a distance from the surface. The way the fascia is constructed greatly depends on the complexity of your logo and text style, the fascia of the shop or premises and how the new fascia will be built up. It is easier to look at existing stores to get an idea of the variety of types and designs and then decide on how you would like yours to look. Pricing depends on size and complexity as each project is bespoke. With many services provided by the team at Signtec ltd there without a doubt a service or product we can provide for you and with our knowledge and services broadening all of the time we can surely help you. We are a premium signmaker in Essex.